AN INTENSE rain front that produced falls of between 50 and 150 millimetres – and in some cases upwards of 300mm – on Queensland’s Darling Downs over the weekend has saved this season’s sorghum crop. 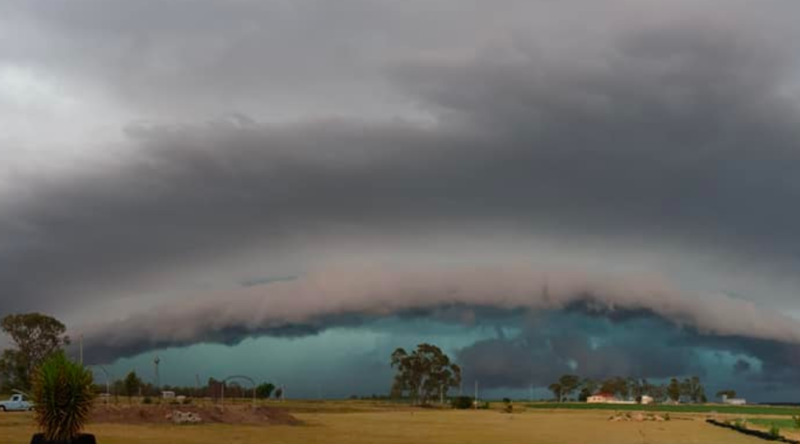 While official registrations from the Bureau of Meteorology show recordings of 133mm at Dalby, 100mm at Jandowae and 53mm at Jondaryan, individual farms to the south and east of Dalby tallied totals of more than 300mm. The farming districts around Cecil Plains and St Ruth were hammered yesterday afternoon by torrential storm rains which, in some instances, dropped 200mm in under three hours. Queensland AgForce grains president, Brendan Taylor, said while the heaviest falls on the Downs were likely to have caused some damage, overall the rain would be a big benefit for growers. “There were some incredible falls south of Dalby. They hadn’t had a lot of rain through there until yesterday and last night when there were phenomenal falls. They had been feeling left out, given the forecast, but they caught up and overtook everyone dramatically,” he said. “The irrigators will all be pumping water. And the big picture is it has pulled the sorghum crop out of the fire. The sorghum crop was a couple of weeks away from going down the tube. “There is crop that is coming out in head that the rain has pulled from the fire and there was an area that wasn’t planted that probably will be now. A lot of cotton would have been looking for a drink too. “There will be a significant mung bean plant now. It is perfect timing for beans around Christmas/early New Year. In the drought-affected cropping regions of NSW, the recent rain event produced modest falls through most areas. On the Liverpool Plains of north west NSW where the dry conditions hit the winter crop hard and have severely impacted summer crop potential this year, Agricultural Consulting and Extension Services consultant, Pete McKenzie, said the rains were very patchy with most areas recording around 25mm for the week, and a few that had 80-90mm. “It is meaningful for any crops that are in. We are finding we have been getting some regular amounts of rain that is starting to contribute to a (soil moisture) profile, but as far as summer crop goes we are still a long way behind where we should be,” he said. “This rain may trigger some more sowing for some people. There was a frenzy of activity early in anticipation of the rain because the Bureau was predicting 50-70mm which some places got, but they didn’t get it everywhere. There will be a bit more sorghum go in, but it won’t be significant compared to what we were anticipating. Generally, rainfall totals for the week throughout the NSW cropping belt were modest, rarely topping 50mm. Notable NSW registrations included Narrabri (35mm), Quirindi (45mm), Coonamble (49mm), Dubbo (29mm), Cootamundra (57mm), West Wyalong (20mm) and Griffith (22mm). In Victoria, where winter crop harvest is still winding up in some areas, some of the biggest falls for the past week were in the Mallee with recordings at Birchip (195mm), Woomelang (175mm), Hopetoun (139mm), Berriwillock (130mm) and Beulah (126). The Wimmera also registered substantial falls for the week, examples being Donald (105mm), Warracknabeal (101mm), Dimboola (79mm), Rupanyup (67mm) and St Arnaud (60mm). The widespread rains which fell through much of Queensland, New South Wales and Victoria over the past week resulted from the development of a low pressure trough in the south east, combined with influences from tropical cyclone Owen moving southwards over Queensland.